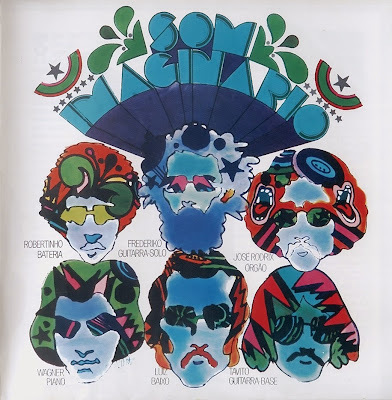 Som Imaginário (Imaginary Music) is a Brazilian band from the 70s. They joined together to support Milton Nascimento in his first record and shows. Their style comes from jazz, classic and rock until popular brazilian music and bossa nova, with strong Beatles influence. They recorded three albums in the 70s and an album live with Milton Nascimento in 1974 releasing them in a boxset in 1997, but it was limited edition. Famous people were Imaginary Music: Naná Vasconcelos, Robertinho Silva, José Rodrix, Toninho Horta, Wagner Tiso, Tavito and Marco Antônio Araújo. This last person recorded four very progressive albums later, but unfortunately died in 1986. The first and second Som Imaginário albums follow the psychedelic line with Beatles and pop influences. José Rodrix left the band, and Wagner Tiso (ex W-Boys jazz band) leaded the band for the new album. The third album "A Matança do Porco" (The slaughter of the pig) is an all instrumental album (with voices but no lyrics), following the fusion and symphonic direction. Some people prefer their first phase, others the third album.